This document explains in simple terms how to design, configure, and operate sound systems for the optimal reproduction of underground (i.e. club / rave / electronic) dance music. Following these guidelines will help ensure that sound systems you design and set up will sound as good as possible, emphasizing the most important elements of dance music, while being accurate, free of significant distortion, and not causing hearing damage to audience and staff members. For reasons discussed below this approach can contribute greatly to the long term success of sound providers, clubs, venues, promoters, etc. Any combination of low-grade speakers and amplifiers are enough to make some noise, but the accurate reproduction of music, with flat frequency and phase response across the entire audible spectrum, at high volume levels, is a science and art that still has plenty of room for improvement, and that will continue to evolve for centuries to come. Tradeoffs are made by all audio equipment manufacturers between accuracy in frequency and phase response, efficiency, equipment volume and weight, and materials and R&D costs. For many applications, such as a low-cost public address system or guitar amp, 1950's era technology works fine. But for the world's largest and most successful sound companies, there is no settling for less than the best. The fundamentals of connecting various pieces of equipment together and operating a sound system are not covered here, as there are many other reference materials that explain the basics of sound systems, such as Yamaha's classic Sound Reinforcement Handbook. Due to the small size and non-mainstream nature of the underground dance music market however, sound schools, books, and other educational resources do not devote much attention to its specific needs. With an understanding of the principles covered here, you'll be better able to set up a sound system that makes dance music sound as good as it can. To do a club or provide sound with a high level of quality, it's important to ensure that the system is "DJ-friendly". Some DJs may not particularly care how easy your system is to perform on, but more experienced DJs generally do care. Some systems are easier and more enjoyable to work with than others. It takes years of experience to be able to mix perfectly on numerous sound systems which can often have various issues such as turntable feedback, needles that skip from the tables being bumped or from floor vibrations, monitors with output levels that are too low, too high, nonadjustable, or halfway blown-out, large sound delays from speakers placed too far away or from echoes off reflective surfaces, lost dynamic range and responsiveness due to over-compression, and various other issues. If your system is designed to prevent these sorts of issues, DJs will like playing on it, the music will sound better overall, and the chances of your success improved. A sound system that meets the following criteria will be more DJ-friendly and more likely to sound as good as it should. Many venues and promoters take it for granted, but a quality sound system is one of the most important ingredients in the success of clubs and events. A top quality sound system is also a great promotions tool, that can be a key differentiator between you and your competition, and that helps make clear to your market that you don't compromise when it comes to quality. These definitions help clarify the elements required to maximize the performance of sound systems for club / dance music. This section discusses these elements and their overall role in a high-quality sound system, and the following sections address how these elements are best achieved. In the earliest incarnations of music, drums and percussion were the first elements utilized, and thus were the construct and foundation of what became known as music. Perhaps the defining element of "underground" music is its attempt to incorporate these root elements, and its primary focus on the participants rather than on the performers. Underground dance music shares with the earliest incarnations of music a foundation of percussion instruments (or their electronic emulation). This is clear in the original manifestations of electronic dance music such as Chicago House in the mid 80's, which was generally characterized by minimal percussive frameworks. Vocals and melody were important elements, but in general neither were present enough of the time to make them defining elements. A natural extension to the connection of dance music and percussion has evolved of its own in the relatively recent past: bass and subbass. As sound frequency becomes lower, its oscillation wavelengths become more closely coupled to the dimensions of the body than to the relatively small dimensions of the inner ear, which is why subbass can be felt as much as heard. It's important to understand the intentions of an event or club, of the participants, and of those playing the music. One goal of many sound professionals frequently is simply to cover the entire venue with high volume sound. Frequently, numerous arrays of speakers are deployed in various places in the venue to insure that there is literally nowhere to go where the sound is not loud. For certain events and styles of music this approach closely matches the intentions of the producers, attendees, and musicians and/or DJs. Frequently this approach is inappropriate however. The old-school rave, a paradigm which emerged out of a wave of innovation occurring between the early 80's to early 90's, and many clubs which have emulated various of its aspects, are in part characterized by a large diversity and range of environments and experiences. The attractiveness of events are often determined in part by the variety and diversity present in the musical styles, entertainment, venue geography, visual design, and in the creativity and innovation brought forth. The underground rave paradigm also historically minimized performer-audience dichotomy. Everyone contributes to the event in one way or another (it's not just about a small group of performers up on a big stage that everyone focuses on intently). The sound can be arranged within this system such that it's maximally effective where desired, yet perhaps completely absent from other areas. Well planned events and clubs often have "chill" areas, to provide quiet and relaxing places and add contrast to the musical landscape. There are presently 8 Sunsonic Criteria. Some may include more than one element or requirement. Several of these elements and requirements are covered in more detail in later sections. I. Speaker Cabinet Selection Should Emphasize Bass and Subbass Reproduction. Dance music has an important yet subtle property that its appreciation and effectiveness are not improved by utilizing high midrange or treble volume levels. In fact, the opposite effect often occurs. Overly loud and harsh midrange and treble sound pressure levels cause a temporary reduction in perceived dynamic range in the listener, induce fatigue and stress, and cause hearing loss. Of equal importance is the subtle property that subbass does not exhibit these properties to nearly the same extent. This is because the energy content of a sound is directly proportional to its frequency and amplitude. Subbass frequencies have large displacement amplitudes, but their frequencies are very low and their wavelengths are very long. As a result they couple more efficiently to the body itself than to the small inner dimensions of the ear, which is why you can feel the lowest subbass frequencies as much or more than you hear them. A. Employ bass cabinets in a sufficient ratio to full-range cabinets such that the subbass, and bass + low mid-bass power rating is at least as high as that of the full-range cabinets. Although quite old now, Cerwin-Vega T-36 style bass bins are classics that work well for DJ systems while being inexpensive, reliable, compact and loud. A newer subbass cabinet we recommend is the Yorkville PSA2S. These have to be heard to be believed, and sound much better than their Unity UCS1P. Whatever you do though, don't go with cheap front-loaded models such as anything by JBL or various Chinese made brands. For systems of less than 4 subs note that front-loaded bass cabinets often have lower power conversion efficiency and may not put out as much bass. Also make sure the subs have a -3dB cutoff frequency of no higher than 30Hz. If you have more money to spend, and require more portability or better space efficiency, look into Meyer, NEXO, D&B, or RCF cabinets. As an example, if you have 2 double 15" full-range cabinets that are each rated at 1,500 Watts program power, you should have as many bass bins as are necessary to put out 1 to 1.5 times that amount of power. In this case 4 Cerwin-Vega T-36s would be an ideal match. A more general approach would be to figure you'll need one single-18" horn-loaded subbass cabinet per 15" or 18" driver in your full-range cabinets. That works out to 2 T-36 style cabinets per double 15" full-range cabinet. Note that the optimal ratio of subs to full-range cabinets does vary depending on the venue. Due to bass loading issues, outdoor venues require more bass bins to provide the same subbass SPL as in an indoor venue. The larger the air volume of a space, the more bass bins you need to produce the same subbass SPL. In addition, in an indoor venue, walls and corners can be used to provide 1/4 or 1/8th space bass loading, which results in far greater subbass efficiency and output level. Outdoor venues do not usually have walls, in which case the bass bins will only be half-space loaded. It takes 4 half-space loaded bass bins to produce the same output SPL as 1 eighth-space (corner) loaded bass bin. This is a subtle but very important property you must keep in mind when deciding where to put speakers. When doing sound in an indoor venue, if the speakers can be backed up into corners, you will get the most bass output. The second best option is to back them up against a wall. If that is not practical either, for instance if they have to be in front of a stage or something and more than 10 or 20 feet from any walls, then you are definitely going to need more bass bins than full-range cabinets. If you are fortunate enough to do sound in a small venue shaped like a simple square or rectangle, with nothing between the dancefloor and the wall and corners, you can back the speakers into the corners and you will get plenty of subbass, even with only 1 bass bin in each corner. Note that these loading issues apply only to bass and subbass. Higher frequencies have much shorter wavelengths and their levels are not significantly affected by speaker placement. B. Select full-range cabinets that have extended low-frequency response, and non-harsh mid and high-frequency response. For powered cabinets we recommend the Yorkville Unity U15P or U215P. These cabinets are well made and sound very good for what they cost. If you have more money to spend, look into NEXO, Meyer, or Funktion-One. If you will not have dedicated mid-bass cabinets we suggest avoiding full-range cabinets that have only one front-loaded bass driver If you don't have large bass drivers with fairly high cutoff frequencies, your bass will not be well defined or have strong percussive impact. Keep your mid and high volume levels as low as possible, so they are clean, crisp, and audible, but not harsh or in-your-face. By having very loud subbass below around 80Hz, solid, clean mid-bass to 200-250 Hz, you can then set the mids and highs fairly low, but the system will still sound and feel very loud. The resulting sound however will be very clear and not at all harsh to the ears, and at the end of the night your ears will have suffered no damage. In other words, below 80Hz is where you want most of your power going. You do need dynamic range and plenty of headroom for the mids and highs, i.e. the amps should still accommodate the program power ratings of the cabinet, but keep them turned down lower than the subbass amps. This also applies to bass/midbass above 80Hz. Too much low-midbass can give a system a muddy, ill-defined sound. Systems should ideally be 4-way, having subs to cover the first 2 octaves (20-80Hz), some mid-bass cabinets to cover the next 2 octaves (80 to 200-300 Hz), then mids covering the next 3 octaves (200-300 Hz to around 3KHz), and high-frequency drivers covering the rest. II. Do Not Use Active Crossovers or Low Frequency Rolloff Filters with Passive Full Range Speaker Cabinets. Active crossovers are used in almost all systems as a means of filtering out high frequencies passed to the amplifiers for the bass cabinets, and as a means of blocking low frequencies from going to the amplifiers for the full-range cabinets. Sealed, horn-loaded bass cabinets sound best when high frequencies are rolled off at 18 or 24 dB/octave, at a cutoff frequency of 60 to 100 Hz. Using a higher cutoff frequency can result in the bass sounding muddy, and in significantly less subbass power handling capability. Note that because bass is inherently non-directional in its propagation characteristics, there is no need to run bass cabinets in stereo. In fact, due to vinyl mastering requirements, the bass sounds on almost all records are in mono. This fact is helpful in simplifying the design and setup of systems. When running subs in mono, be sure that the mono source is a sum of the left and right channels. By summing the channels together you get a true mono sum signal for the subs (as opposed to running them in stereo or from the left or right channel only), which provides better bass accuracy, and partially cancels out low frequency vertical displacement and feedback that occurs with turntables. Also note that in no circumstances should full-range speakers be run in mono. Stereo is one of the most significant advances in the history of audio reproduction, but you would be surprised how many sound companies cut corners and run the entire system in mono, since it is easier to set up and requires fewer amplifiers. Because of Criteria I, we do not require high volume levels at mid and high frequencies. Thus the average power level delivered to the full-range cabinets will be lower as a percentage of maximum rated power than the average power delivered to the bass cabinets. Because of this reduced SPL requirement, there is no need to run full-range cabinets through an active crossover. This results in louder, better-defined bass being delivered from the full-range cabinets, giving the system better transient response and clean, accurate bass with more percussive impact. Most sound companies rely on the bass bins to reproduce all the bass, and send none to the full-range cabinets. Subbass cabinets generally have low natural upper cutoff frequencies (typ. 80-150Hz) and thus have poor transient response, making it more difficult with this approach to obtain clearly defined, accurate bass. In theory if you split the frequency components between drivers they will combine together just great but in fact, it sounds better to have some overlap and no sharp filter slopes. In general, only large drivers with high cutoff frequencies, such as 15"s or 18"s cutoff at 500Hz or higher, have the transient capabilities needed to make a system sound really good. To get accurate transient response from a system that does not have large drivers covering the entire bass spectrum requires the system to be controlled by a processor that can precisely phase align each cabinet, which may require complex configuration steps to be followed. A. Do not filter the signal going to full-range cabinets. It is OK to employ a rumble filter (i.e. sharp high pass filter with a cutoff of 15-20 Hz), though this is usually not necessary because many mixers, processors, and amplifiers already have subsonic filtering built-in. Again, do not run the signal going to your full-range cabinets through a crossover. Full-range cabinets are called "full-range" because they are designed to reproduce the full range of audible frequencies. Most sound providers, clubs, etc. fall victim to the mainstream industry practice of filtering the lows out from the full-range cabinets, and as a result their systems end up with incoherent, weak sounding bass. This unfortunate practice came about for two reasons, (1) to allow full-range cabinets to put out more midbass, and (2) to reduce the likelihood of blown woofers in case of levels getting too high. As we previously discussed however, too much midbass (especially in combination with less subbass) gives systems a very unpleasant sound. And in regards to (2), this is a backwards mentality, which makes about as much sense as running no sound at all to the speakers to insure they can't be overdriven. The better thing to do is be careful with your levels, and make sure you are using a high quality leveler in your system so that the levels cannot go too high even if the DJ cranks everything on the mixer. B. Always use an active crossover or low-pass filter with bass bins. Pretty much everyone knows this, but there have been times that we have played on other people's systems and they were running the bass bins full-range. This results in too much midbass and substantially diminished subbass, and it sounds terrible. Also make sure the crossover or filter has a cutoff rate of 18dB/octave or higher, and that it sums the left and right inputs together, so that your subbass signal is a true mono sum of both inputs. III. Avoid the Use of Compressors with Short Release Times. Most sound system providers mistakenly use a compressor in place of what is called a leveler. A true leveler is simply a compressor which has the capability of utilizing long (5 Seconds or longer) release times, thus allowing the system gain to remain fairly stable while still ensuring the output signal level does not go too high. Many compressors simply do not have long enough release times to avoid the loss in dynamic range and pumping effects that result from fast compression. The problem with many compressors is that they have cheap level detector circuits which do not allow for release times of more than 1 or 2 Seconds. Digital compressors are less likely have this problem and can work well as levelers. Other products such as Auto Gain Controllers or Automatic Level Controllers are also available, but these usually don't add any essential functionality over that of a basic leveler, can be higher in cost, and may not work any better than a cheap compressor. Many general purpose digital processors are now available which can take care of leveling, parametric EQ, timing/phase alignment, and crossover filtering functions, in one inexpensive and compact unit. In any case, whatever you use must have a maximum Release Time of at least 5 full seconds. One product we do recommend is the Aphex 320A Compellor, though similar performance can be obtained with a higher-end compressor from manufacturers such as Rane or Ashley. Maximum performance ss obtained from a sound system when it is operated at a power level where the bass output is at or near its maximum, without significant distortion or risk of driver damage. Because few DJs have the sensitivity to consistently maintain the levels at exactly this optimum point, it is necessary to either have a competent sound person continually monitor and adjust the levels, or use a leveler. Most sound providers find it much easier to use a leveler (or unfortunately as is the usually the case, a cheap analog compressor) than to spend the whole night personally monitoring the levels. Still other sound companies will use neither a leveler or compressor, nor personally monitor the levels, but will instead set the levels fairly low so that even with the loudest record they cannot get too high. This results in the system generally being operated at 50% or less of its potential power, and in the levels on the mixer being run too high, which causes distortion. A similar but even worse alternative that is often employed by sound "professionals" is the use of low power amplifiers in the system, such that the speakers cannot be blown no matter what the input levels to the amp are. A third alternative is installing mechanical or electrical limiting devices in or on the mixer, so that the levels cannot be set at higher than "7", and the EQ controls are effective only in the negative direction. With the levels set appropriately and checked periodically, this approach works well, and results in improved sound quality since the mixer cannot be pushed into distortion. The ideal solution is the use of both a leveler and mechanical limiting devices in the mixer. Compressors with short release times usually make things sound bad because they impart a widely varying system gain that can fluctuate by a factor of 10 or more between bass peaks and valleys. This results in louder sounds being made quieter, in quieter sounds being made louder, and in the envelopes of the various sounds being distorted and flattened. The net result is the turning of clear, high dynamic range music into muddy, flat sounding music. It is analogous to turning the contrast all the way down and the brightness all the way up on an old TV set – a clear image can be turned into a blurry white-wash of light. There are applications where shorter release times are appropriate, such as in microphone processing, or in the mastering of a record or CD, as these will sound louder overall with fast compression. However this additional loudness is not necessary on a sound system which is already quite loud. Added loudness at that point will usually make the system sound overly loud and lacking in dynamic range and clarity. Also worth considering are digital loudspeaker management processors from companies such as BSS, XTA, Rane, Allen&Heath, and others. These combine crossover and limiting functions into one unit. Be very careful about these however, particularly with the more inexpensive ones, as they can be very tedious to set up properly and may not offer adjustable limiter release times. Before buying one make sure it has (1) adjustable limiter release times that will go up to at least 3 full Seconds, (2) crossover bypass capability for the full-range cabinets, (3) ideally some other built in functionality such as parametric EQ, and (4) that it can be easily set up and adjusted without having to spend hours reading through the manual or clicking buttons. An advantage of more expensive sound systems from NEXO, Funktion-One, and other high-end manufacturers is that they have a thorough system design which includes full-featured processors that provide optimized limiting, crossover filtering, and timing and phase alignment. These systems often do not provide true leveling functions however, in which case a leveler is still needed for preventing over-compression. Set your compressor/leveler so there is no more than 3dB of gain reduction when the mixer is at it's 0dB meter reading, with an attack time of around 30mS and a release time of at least 3 Seconds. This will ensure the overall output level is maximized, and that the inter-channel levels are balanced. Because cartridges typically have +/- 1.5 dB of inter-channel gain tolerance, not to mention the variation in the record itself and in the mixer, it's good to have something to compensate for that. A compressor set for 3dB of gain reduction, infinite compression ratio (i.e. a leveler), and dual mono rather than linked operation, is ideal for this purpose. It is important when doing this to ensure that no more than several dB of gain reduction can result however, or the DJ will not have tight control over the EQ, i.e. if the DJ changes the bass setting on the mixer, the compressor/leveler will compensate in the opposite direction, resulting in the system being unresponsive to the mixer's EQ, and in the mids and highs "pumping up" when the bass gets quieter. It is also a good idea to put a note on the mixer which states something to the effect of "Attention DJ: Please keep output level near 0dB. Going above this will not actually make things any louder, but will result in decreased mixer responsiveness and in increased distortion." If the club is likely to have different mixers in use, you may want to post a note in the DJ booth instructing the DJs to set the levels on the mixer so that there is no more than several dB of gain reduction that shows up on the compressor/leveler. Different mixers have different gain structures and thus "0dB" is not the same on all mixers. Perhaps the most important point of all, is to securely lock the compressor/leveler and amps behind a clear plexiglass or fine-perforated steel panel. The DJ should always be able to see the compressor/leveler so it is clear how much gain reduction there is, but no one but you should be able to touch the knobs! If you leave any knobs accessible to anyone it will not be long before you end up with blown speakers, terrible sound, or both. Also do make sure the amps and rack equipment have plenty of ventilation so they will not overheat. It is indeed a bad sounding situation when a compressor is used with too short of a release time or with too much gain reduction. Surprisingly however, much of the audio industry and the majority of clubs and sound professionals seem to be entirely unaware of this, and run their systems in such a way that the resulting sound is over-compressed, with little dynamic range or transient detail. In 1996 the Sunsonic MX500 DJ Mixer introduced an Auto Gain Limiter function which ensured the mixer output would always be at an optimum level, guaranteeing optimum sound quality and eliminating the need for an external compressor/limiter/ALC. This model is no longer available however, and for a number of years no other DJ Mixer manufacturers offered this feature. Rane stepped up and introduced this feature into their MP44 DJ Mixer, though its release time is very short, making it necessary to modify the internal limiter circuitry for it to be of any use. Developed in 1996, the Sunsonic MX1200 Professional DJ Mixer was the first DJ mixer to include an Auto Gain Limiter levelling system, and a joystick Cue Source control. A simple yet very effective and high quality internal leveler can be added to DJ Mixers by an electronics expert. Install an internal motorized volume control (such as those found in most consumer Stereo Receivers), which is set to reduce the output level if the topmost LED's light in the mixer's level meters. Then use a buffered RC circuit to slowly return the volume control to its normal setting. (We can supply a parts list and schematic at no charge, or can make this modification to a mixer for you.) This is a highly cost effective approach which has the advantage of leveling the signal in the mixer, as opposed to after the mixer, where the signal may already have gone into distortion. IV. Place Speaker Cabinets as Closely Together as Possible. Sound is simply the variation of air pressure. Because air is relatively thin, pressure differentials propagate through it relatively slowly. (Sound travels at about 1000 feet per second in air.) A difference of only 30 feet between two speaker cabinets thus results in a delay of 30 milliseconds between when the sound from one will arrive at the other. If the effect of such a delay is examined on a sound such as a snare drum or hi-tom, it is obvious that the combining of two such sounds with delays of more than a few milliseconds between them has destructive results. Many clubs fall victim to the "let's put speakers everywhere" mentality, and have speakers separated by distances of 100 feet or more. If viewed from a music theory perspective, it is clear that a 100 foot separation results in approximately 100mS of delay. For even a fairly slow tempo of music, such as 120bpm with a 4/4 signature, 100mS equates to almost a full 1/16th note! Few people would disagree that any band or DJ who was always 1/16th note off, would be kicked off the stage. Clearly then it should be an emphasis of good club design to minimize the distances between speakers. A follow-on point to this is that it is always better to use a small number of high powered speakers than a larger number of lower powered speakers. The greater the surface area from which sound is radiated, the larger will be the delay spread, and the more drastic will be the resulting timing misalignments and interference patterns. This is analogous to dropping stones into a still pool of water. If only one stone is dropped in, a single group of pristine circular waves will radiate out. If several stones are dropped in however, a complex frequency-dependent pattern of nulls and peaks will be created, and the waves from each source will arrive at different places at different times. "Patchwork" systems with a dozen or more cabinets seemingly from numerous manufacturers and various historical eras are often surprising in how little sound they put out and how bad the overall sound quality is. A simple system with for example 4 Yorkville PSA2S and 4 U15P will generally be much louder and cleaner. A. A single row of bass bins with full range speakers at each end (on top): This configuration delivers the most accurate and most intense bass, because all the bass bins are right next to each other. With 6 or 8 bass bins, there is still plenty of separation between the full range cabinets to deliver excellent stereo imaging. B. Two stacks of speakers, separated by no more than 25 feet. This is a less desirable setup for smaller systems, but works well for larger systems. For maximum bass response, always place all bass cabinets on the floor, with their backs directly against a wall, and preferably in a corner. The lower the air volume within one wavelength of a bassbin (i.e. within about 30 feet), the better the impedance match will be between the air and the bass drivers. As a result, two things will happen. First, the acoustic power conversion efficiency of the drivers will go up exponentially due to the improved impedance match of the low impedance cone driver to the normally high impedance air. Second, the relationship between bass SPL and distance from the cabinet will become more linear as opposed to inverse exponential. This means the bass will travel further, due to the horn loading effect created by a corner made by two walls and the floor. In this type of corner, a bass speaker only has to push air in 90 degrees in each axis, i.e. it is 1/8th space loaded. An 1/8th space loaded bass cabinet will have several times the acoustic power conversion efficiency as a 1/2 space loaded (i.e. on the floor but not near any walls) cabinet. Considering these points, it's clear that you can get much more bass from the same bassbins simply by placing them optimally. Note that for smaller sound systems the DJ does not necessarily need to be behind the speakers. Raves and clubs are often set up this way, but it can be counterproductive to use this approach for dance music. If the speakers are backed against a wall for example, and are facing the DJ, it is not a problem for the DJ if he or she has a good loud monitor (with a separate booth monitor level control on the mixer of course). In fact, this set up is preferable to many DJs, as they can then between mixes for example turn down the booth monitor and hear the main speakers exactly as the audience is hearing them. For larger systems however it is better if the DJ is not overwhelmed with sound from a huge system pointed right at him/her. It is easier for DJs to mix if the ambient SPL is fairly low compared to the DJ monitor level. The monitor should be clear, not too loud or too quiet, and there should not be too much reverberation or reflection from nearby walls. A final note relating to speaker placement is to avoid at all costs setting up two systems in the same room. Because of the logarithmic sound perception mechanisms of the ear, it is ruinous to the music and sound quality in both areas if significant acoustic coupling exists between them. The only practical solution for this is to insure there is a completely separate room for each system (i.e. a full floor-to-ceiling wall between them), or, if the systems are outdoors, that cabinets from different systems are always at least 50 feet apart and facing opposite directions. V. Take all steps to insure feedback will not occur with turntables. Sound systems that put out more than 1,000 Watts of bass must have solid, vibration-proof footing for the turntables, or feedback can occur. There are several approaches to solving this problem. Without them, the power handling capacity, dynamic range, and accuracy of the system can be drastically reduced. One approach to preventing feedback is to use an electronic feedback destroyer (a.k.a. feedback suppressor or feedback eliminator). There are now many models available at low prices. Note however that feedback suppressors are a secondary fix, which attempt to address the symptoms of feedback, but not the cause. If the turntables are on solid footing, the system will be cleaner sounding, more stable and accurate, and will not be dependent on a feedback destroyer to fix everything. 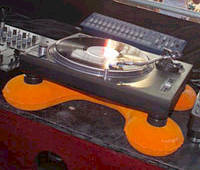 The ideal footing for turntables is a vibration-proof table placed directly on a concrete floor or on the ground. Vibration-proof materials include cinder blocks, which are cheap but heavy (making them better for permanent installs than for mobile sound systems), or wire shelving (such as Metro or Nexel), which also has many accessories available such as wheels or rack mount rails. With wire shelving it helps to weigh the bottom shelf down with some cinder blocks, sandbags, or your amplifiers, so the needle will be less likely to skip if the table is bumped. A more cost-effective table can be made from an ordinary banquet table by securely attaching 4x4s, or 4 or 5 layers of 3/4" 2'x6' pieces of particle board to the top. Another option is to pour 1" or so of concrete into the bottom of a DJ coffin. Note that the turntables should not be left inside of a DJ Coffin which has not been reinforced like this. DJ coffins are usually made of thin wood that easily vibrates and conducts feedback. The foam lining inside some cases can also be deceiving it looks like it should reduce feedback, but in reality it can allow feedback to bypass the vibration dampening systems that turntables have built into the feet. Set the turntables directly on the cinder blocks/concrete/4x4s/wire table, and make sure these are on solid ground. Stages, scaffolding, etc. should be avoided whenever possible. What the turntables are placed on can be just as important as anything else in the sound system. We have seen sound companies bring 10 or 20 cabinets to an event, and then put the turntables on a flimsy table. Feedback then occurs, requiring the levels to be kept turned down below the point of noticeable feedback. In this scenario the 10 or 20 cabinets that the promoter paid to rent are not putting out half the power they could, and sound bad. For venues that do not have solid flooring available, the floor will conduct feedback, and you will need to use some sort of cushioning material to isolate the turntables from the floor. Another alternative in these cases is to suspend a rectangular structure of 4x4s from the ceiling using chain or rope. The turntable feet should rest directly on the 4x4s. This is also good for preventing needle skips from the floor movement that occurs from people jumping up and down when they are dancing. Keep in mind that even though a stage or wooden structure may appear solid, unless it is concrete or dirt, or very thick wood (4" thick or more), bass will still vibrate it and feedback can result. We have done testing of various materials which are available for preventing feedback, and summarized the results in the table below. For this test, a Cerwin-Vega T36 bass bin was placed 2 feet from a standard 2' x 4' particle board banquet table, on which were placed 2 Technics SL1200 turntables. The needle was put in the last inner groove of a record where it loops continuously and there is no music. The floor used for the test was carpet above a thin layer of concrete and wood. The system gain was then increased until just before the incidence of significant sustained feedback, and the gain was noted. The winner of the test is a product released in 2003 in the US called "FREEFLOAT" (see picture below). These are inexpensive and work great, though one issue is that they can go flat, so it is good to have a backup in place such as some foam cushions underneath. Putting the DJ Coffin on top of 2 small patio cushions works well (a 15dB improvement in this test) while allowing the turntables to remain very stable. The FREEFLOAT cushions are more wobbly, but are better for very large sound systems or exceptionally flimsy flooring. This test likely is not highly representative of other sound system configurations, and does not consider other factors such as skip resistance from shock. The FREEFLOAT cushions however were specifically engineered to reduce feedback by a huge amount, while remaining stable enough that the additional slight wobbliness does not seem to bother DJs and does not seem to cause the needle to skip even when cueing records and shaking the turntable. The FREEFLOATs are a great product. Unfortunately they can be hard to find, and they often run out of air. We now use some medium-density foam tri-fold futon cushions, 27" x 75" x 4" in size, which work great and comfortably hold a 12" mixer, 2 Turntables, and 2 CDJs. Keeping the bass bins at least 15 or 20 feet from the turntables can be helpful with larger systems, as heavy subbass can vibrate the turntables themselves, regardless of what they are on. As is mentioned in other sections of this document however, in order to minimize intercabinet delays the bass bins should not be more than 20 feet from the DJ or from each other. VI. Use as Few Processing Components as Possible. The ideal sound system consists of turntables, a mixer, leveler, low-pass filter or crossover (for the bass cabinets only), amplifiers, and speakers. Nothing else. Many sound providers think that the more EQs, compressors, dynamics processors, and various other fancy looking devices they can put in a rack, the better. While many types of processing components have their place, generally they do more harm than good if not used correctly. Each piece of equipment that is added to a signal chain causes phase and dynamic range degradation of the original signal. Considering the high level of production quality with which most underground dance records are produced, there is rarely a need for processing of any kind. An exception to this is for equalizing a small room that has bad resonance peaks in the frequency response. Generally however, an EQ will do more harm than good. Even if a room is optimally EQed with a Real Time Analyzer or other tools, that does not always mean it is going to sound good. As the room becomes filled with people, as different tracks are played, or depending on where you stand in the room, an "optimized" EQ setup can end up sounding worse than if no EQ was used at all. If used minimally, with the settings closely monitored as the event progresses, EQs can be beneficial, but otherwise they are more often misused than used correctly. Perhaps one of the most inappropriate uses of EQs is for boosting the low and high frequencies (i.e. the infamous "V" curve). Apparently, many sound providers and DJs have lost much of their hearing capability in the high frequency ranges, because they seem to think it is necessary to boost that range by as much as 10dB. Another problem with EQs is that they are often designed such that the signal is passed through each filter one by one, each of which introduce some phase degradation. If you must use an EQ, use a Parametric EQ with 3 to 5 variable Q, sweepable bands. These are better for most EQ applications and have better phase performance. Worthwhile of mention again is that an inexpensive system controller (a.k.a. loudspeaker management processor) can in fact handle all the signal processing requirements of even a large sound system. Because all processing occurs digitally inside a single mixer/processor at high bit depths, there is less degradation in signal quality and reliability than would occur with several processing components chained together. VII. Minimal Phase Delay Crossover Networks Should be Used in Full-Range Speakers. The higher the order of filtering in a speaker's crossover network, the higher the level of phase distortion that will result. The derivative of phase delay is group delay. If a sound system does not have a constant group delay, different delays are induced to different frequency components of an audio signal. This is much more detrimental to dance music than most other types of music, because percussion is its most important element. Percussion sounds in general are defined by an initial large amplitude impulse (caused by the striking of two surfaces together) followed by a decaying resonance (caused by one of the surfaces oscillating at its natural resonant frequency). An impulse is the only kind of sound that does not have a characteristic frequency in fact, if an impulse is evaluated in the frequency domain, it is seen to consist of all frequencies simultaneously. When such a sound is fed to a bass cabinet and a full range cabinet, the sound will pass through the various crossover filters to each driver in each cabinet, where the respective frequency components will be radiated. The more filtering done in each crossover, the greater the delays and time differences generally will be between when each component is radiated from each driver. Without minimal phase delay crossovers, the initial precise millisecond "kick" of a clean kick drum sound will come out of each driver at different times, resulting in an incoherent, weak sounding drum. The reason sharp cutoff filters are used in most full-range speakers is because they allow higher broadband power levels to be sustained by each driver. For the purposes of dance music however there is not as much need for exceptional power handling capability in the mid and high frequency drivers. Often it is not practical to replace existing crossover networks within higher-end speaker cabinets, because they are usually highly customized to the electrical and acoustic properties of the cabinet and drivers. Replacing them with generic minimal phase delay crossovers can result in degraded frequency response and may circumvent overload protection circuitry in the original crossover. Some high-end cabinets are often designed with some phase correction built into the crossover system (or they can be run bi-amp/tri-amp, allowing for precise phase correction to be done in an external processor). These types of systems may sound fine even if not a minimal phase design. But for most cabinets, going to a minimal phase design can often make a huge improvement in sound quality. If in doubt, hire an experienced Electrical Engineer to evaluate the system phase response, and if necessary, modify the existing crossovers to a 6dB/octave design with characteristics closely optimized to the cabinets and drivers. Often a good time to upgrade to a minimal phase crossover is while other repairs are being made. A type of speakers used by Sunsonic in the mid-90's for example were a pair of Sonic double 15" full range boxes using a Peavey 22XT compression driver. The 22XTs have a very harsh sound and a pole in the frequency response at 8KHz. After a lot of use the seams in the cabinets started coming apart due to the vibration, and the cheap wood and construction practices with which they were made. The crossovers were mounted on plastic mounting cups, which had become cracked. The existing crossovers were recycled and replaced with a Sunsonic designed and built 6dB/octave crossover with a 750 Hz cutoff frequency, a compensation circuit for the pole in the 22XTs frequency response, and a light bulb overload compression circuit. (Light bulbs are natural power compression circuits their resistance increases in proportion to filament temperature). This was all assembled onto a metal mounting plate, using RTV sealant and 12 gauge stranded wire throughout, and the cabinets then reinforced with screws and wood pieces. The cabinets then delivered hard, precise bass and percussion that would be expected only from a $1,000+ cabinet (but at a cost of only $350 plus $50 in parts). An A/B comparison was done between the first cabinet after it was done and the second before taking it apart, and the difference was amazing. An exception to this criteria can be made in cases where the crossover filtering is done in a high-end digital processor which can apply timing and phase corrections based upon manufacturer-supplied parameter settings specific to each speaker cabinet. Note however that these types of systems are substantially more expensive and can sound bad if not configured correctly. VIII. Amplifiers should be able to supply the program power rating of the speakers. In the case of bass bins, Impulses are of such short duration that they are mostly filtered out of the signal going to the bass bins, so they do not technically need as much headroom as full range cabinets. However, bass bins are more likely to present large reactances and greater average power consumption than full-range cabinets, and so this criteria applies to them as well, if for slightly different reasons. If you had an unlimited budget it would be even better if your amps were able to supply the full peak power rating of the speakers (peak power is generally defined as twice the program power rating of a speaker, or four times the continuous rms power rating), but the difference in quality will generally be insignificant enough that the added expense would not be justified. Amplifier power ratings are different for different load impedances. Due to increasing resistance in driver coils as their temperature increases, and irregularities in driver impedance curves, impedances seen by an amplifier are often substantially higher than expected. In addition, voice coil reactances can cause momentary impedances to be presented to an amplifier which are equivalent to 4 to 10 or more times greater of a load than the speaker's rated impedance. As such it is suggested to not run amplifiers at their lowest rated output impedance. For an amplifier to maintain tight control over a voice coil in these conditions, it must have plenty of available headroom, a very high damping factor, and the speaker cables used must have near-zero resistance. (We use only 8 AWG (6.5 mm2) cabling to subbass cabinets.) Also note that only heavy gauge AC Power extension cords should be used. We advise the use of no smaller than 10 AWG (4.0 mm2) extension cords. Using thinner AC Power cords than that can cause significant voltage drops and can result in your amps clipping much sooner and in their power output capability being reduced by 25% or more. As an example, to drive 4 full-range speakers which each have a 4 Ohm nominal impedance, and 1000 Watts program power handling, an amplifier capable of delivering at least 2000 Watts per channel at 2 Ohms is required for optimal sound quality. Note that you must know what your amplifiers can put out at all load impedances. For example, an AB Intl. 9620 Amplifier is rated as follows: 2000 W/ch @ 2 Ohms, 1500 W/ch @ 4 Ohms, or 900 W/ch @ 8 Ohms. A Cerwin-Vega T-36/750 bass bin is rated at 1000 Watts Program power at 8 Ohms. If you wanted to push 4 T-36s from an AB 9620, that would be a 4 Ohm load per side, which would give you 750 Watts into each T-36. If you did not take the load impedance into account, it would be easy to make the mistake of thinking that it is a 4,000 Watt amp, and so it should be perfect for driving four 1,000 Watt speakers. This would be true if the speakers were each 4 Ohms, but T-36s are 8 Ohms. As a result, an AB9620 is not enough to make 4 T-36s sound as good as they can. We have done side by side tests with bigger and smaller amps and you really can hear the difference. Bass bins sound tighter and cleaner when they have plenty of available power behind them. A Crest Pro 9001, Pro 9200, QSC Powerlight 6.0, Crown Macro-Tech 5002VZ, Lab-Gruppen fp6400, or Camco Vortex 6 would be much better for pushing 4 T-36s. The problem is that T-36s have an unusually high load impedance for their power rating. This means you either need a 5K or 6K Watt amp (in stereo mode) to push them comfortably, or you could instead use 2 smaller amps in bridge mode. For example a Crest CA9 or Crown K2 in bridged mode would be an excellent match for 2 T-36s. Note that most amplifier manufacturers make several different grades of amplifiers. Consumer grade amplifiers should be avoided at all costs, as they can easily overheat and shut down and their audio quality is not as good. If you have a little more money to spend, look into Lab-Gruppen, or Crest's Pro 200 Series amplifiers. These are also very high quality, but are much lighter and easier to transport. Avoid anything by JBL, Behringer, or Chinese brands. The frequency response of a sound system is not a constant function within any venue. Essentially there are two elements that determine overall frequency response of a sound system within a venue. Unsurprisingly, these two elements are the sound system itself, and the venue. A sound system that is set up according to the Sunsonic Criteria, and that employs well designed, high quality system components, will exhibit an acceptable, even frequency response. What this means is that the ratio of output level of the system to input level will be fairly constant regardless of the frequency of the input signal. However, there are a number of issues that make this all more complex than many sound equipment manufacturers might like you to think. Almost all sound systems have substantially different directivity at different frequencies. Very low frequencies have omnidirectional propagation characteristics, whereas higher frequencies can be more easily directed. This is simply due to the fact that to manipulate the directivity of a sound wave, a horn structure is required. The size of a horn structure required to implement a given directivity is proportional to wavelength, which is inversely proportional to frequency. To provide a high degree of directivity at a frequency of 20Hz for example, requires with a horn structure with a throat length of over 30 feet. The result with most sound systems is then generally that the full range cabinets are much more directive than the bass cabinets, so if one stands far from the speakers, along the axis of the horns in the full range cabinets, the bass will be much lower relative to the mids and highs. In contrast, if one were to stand near the speakers, but to the side, and hence not on the axis of the horns in the full range cabinets, the bass would be much louder than the mids and highs. So, in this type of system, there is already a large amount a variation in the frequency response of the system based simply on where the listener happens to be. The fix for this issue is simple: Use full range cabinets that have low directivity. This ensures all frequencies are radiated with fairly equal intensity across the entire view of the speaker cabinet. For very large sound systems, frequency response and SPL uniformity concerns become major design issues. However, upon review of the "Characteristics of Dance Music" Section in this document, it becomes clear that SPL uniformity is not always our goal. Thus these design issues, which can be very complex, are not much of an issue typically for underground dance music. In a sense then, the old principle of K.I.S.S. (Keep It Simple, Stupid) proves itself here to be true. Each speaker in a system should have consistent phase response and be driven with a phase correct signal. Otherwise, cancellation will occur, as one driver may be pushing air while another is pulling. This can have very noticeable impacts on the system frequency response, bass SPL, stereo imaging, and overall sound quality. Systems that have multiple models of amplifiers, speakers, cables, etc., can very easily have phase errors among different system components. This is mainly due to speakers, amplifiers, or processing components having differing polarity conventions due to design differences or wiring errors, or can be due to connection errors among system components. To avoid these issues, it is necessary to fully characterize the input-output phase relationship of each component in the system, all the way down to the cartridges on the turntables (which could have the cartridge lead wires reversed on one channel, but correct on the other, causing Left and Right channels to be 180° out of phase), up to the individual drivers in the speakers (which may have had a driver unit replaced at some point and the lead wires connected incorrectly, or a crossover replaced with a different design). It is suggested to enlist the help of an electrical engineer for this task, as this process can become complex. Ideally, the entire system will consist of entirely top-grade, perfectly maintained equipment and cabling, for which the phase specifications are well documented. This is often not feasible however, due to the limited budgets that many sound providers are constrained by. A simple method for checking whether a component is phase inverting or not is to connect a Signal Generator to the input, and observe input and output (simultaneously) on an Oscilloscope at various frequencies such as 20Hz, 600Hz, and 20KHz. If a Signal Generator is not available, use a Synthesizer or a test tone record. If an Oscilloscope is not available, use a Multimeter to read the AC Voltage on the input first (let's call this Vin), and then on the output. Then adjust the output gain until the output Voltage is the same as the input Voltage. Then measure the AC Voltage between the input and output (let's call this Vdiff). The magnitude of the phase difference is then approximately 180° times half of the ratio of Vdiff to Vin. In the case of measuring output from a speaker, use a microphone and microphone pre-amp as the input to the Oscilloscope or Multimeter. This topic is not specific to underground dance music, but is worth a few paragraphs here because though it is a simple issue, most people are completely unaware of how to fix noise problems that occur due to ground loops. Ever hear a loud hum or buzz after you connect a stereo or sound system to other gear? It was probably because of a ground loop somewhere in the system. Ground wires are present in most power cords and signal cables, and if ground wires are connected such that they create a loop, that loop will act as an inductive coil that converts magnetic noise into electric current. Residual magnetism from AC power lines and nearby electrical devices then gets converted into noise currents on your power and signal cables. There are many different ways that different audio, video, computer, etc. equipment can be designed, and some models are more vulnerable to conducted noise than others. The important thing to remember however, is that every single piece of electronic equipment in your system, MUST HAVE ONE – AND ONLY ONE – ground connection. Generally in a small system, only the mixer should be grounded to an AC outlet, i.e. with a 3 prong power plug. Any turntables, CD players, and microphones then plugged into the mixer will then be grounded through the mixer's ground, by way of the Ground wire, or "shield" in the audio cable. Now let's say you run an audio cable from that mixer into an amplifier that also has a 3 prong power plug. If the amplifier does not have a "Ground Lift" switch that is "lifted", you now have a ground loop. In this case, the loop is a triangle that is formed by ground wires in the 2 power cords and the ground wire or shield in the audio cable between the mixer and the amp. To fix this, you have to break the loop. By "lifting" the ground on the amp, it will still be grounded through the audio cable to the mixer, but the ground loop will have been broken because the ground wire in the amp's power cord is no longer connected to the signal ground. If the amp does not have a ground lift switch, you can use a ground drop adaptor, i.e. a 3 prong to 2 prong adaptor. These are available for less than $1 at any hardware store and at many grocery stores, for allowing 3 prong plugs to be used with older style 2 prong outlets. Note that most consumer mixers have 2 prong power plugs. In this case make sure that at least one of your amps is grounded with a 3 prong plug, and that if it has a ground lift switch that it is not "lifted". Very important to note however, is that you must be sure you have one ground connection for everything! One too many grounds, and you have a ground loop, and probably hum and noise. But if you have too few grounds, there is potentially a very serious safety hazard, where someone could get electrocuted! Proper grounding is a subtle, but extremely important issue that must be taken very seriously. We strongly advise that you consult an Electrician or Electrical Engineer if you are unsure about anything relating to how to properly ground your equipment. The layout and design of a sound system, and the positioning of speakers, lighting, dance floor areas, the DJ, etc. should be designed with higher concerns in mind, such as the comfort of attendees, the design themes of the event or club, and particularly any spiritual or religious themes associated with the event, music, or attendees. As far as the underground dance community is concerned, this means the sound and lights must not be overbearing or intrusive, or otherwise obstructive to a positive, open environment. Hang your mirror ball at least 12 feet from the dance floor. This will ensure that all the positive energy released through your scalp will have space to dissipate. Too many positive waves crushed into a small amount of air have the ability to generate a friction that may lead to sudden mood swings. Speaker stacks, as a rule, should only ever be placed on the dancefloor itself. Never hang from the ceiling or attach to a wall. Sound frequencies must be allowed to enter through your toes first, never through your ears. This will boost your chakra from below and elevate you mentally. Neon lights, strobes, and rotating pin spots should work on a cycle, and be evenly spaced. Lights that are placed too tightly together counteract with your aura and this leads to a negative feeling. Avoid this by measuring carefully. Remember to only mix pastels with pastels and primaries with primaries." These points make intuitive sense if you think of different clubs you have been to which were or were not designed along these lines. Perhaps the greatest design weakness of many club sound systems is the concept of hanging speakers at heights of 10 feet or more. These speakers cover the audience with more than enough mids and highs, while providing a disproportionately lower level of bass and subbass. By placing all speakers on the dance floor only, with a number of good bassbins standing directly on the floor, and the full-range/mid-hi cabinets directly on top of the bins, the sound is then felt as much as heard, and the mids and highs are not so loud relative to the bass and subbass. For example, if you were to stand 20 feet from a stack of speakers, you would have basically the same view of the mid-hi/full-range cabinets as the bassbins, and as such, the bass would remain proportionate in volume to the mids and highs. If however, the mids and highs are being radiated from above the audience in a direct path to your ears, several things occur: First, since bass bins are placed on the floor in almost all clubs, the bass is then partially blocked and absorbed by the audience, but the mids and highs are not. Second, the high frequency drivers used in most club systems are highly directional, whereas bass and subbass frequencies are omnidirectional by nature. As a result of these factors the bass and mids/highs become inconsistently matched in terms of volume, and at same time have less coherence and clarity. If you think back to times you've been really amazed by a sound system, more often that not it's because you heard it on a system providing a solid level of bass and subbass, that allowed you to really feel the music. As underground venues become more restricted by the political powers that be in many cities, clubs are increasingly where events/parties are held. Because club sound systems are typically permanent installs, they are more likely to employ overly complex and overbearing speaker placement strategies. Second, if it is a permanent install, the effects of such designs are long term as well. Note that most club managers, owners, and promoters are not aware of any of this, so make it a point to bring these issues to their attention whenever you happen to go to a club that has one of these overkill sound installations. Another advantage of placing speaker stacks on the dance floor, rather than in numerous elevated locations throughout a venue, is that the sound is then radiated from a smaller, closer array of locations. This insures that the timing between the sound sources is better aligned, and as a result, that the clarity of the system is maximized. Because sound travels at only about 1 foot per millisecond in air, a difference of 50 feet for example between two speakers will cause a delay of up to 50 milliseconds between when a listener hears the signals from each. Combining multiple signals together with delays of that order is destructive to the transient response (a.k.a. "impact"), frequency response, and clarity of a sound system. In some large venues these timing differences can be so large that in some areas the sound from different speaker stacks (and/or wall reflections) combines such that it sounds like a constant trainwreck. The cure for this type of sound system is combining all the speakers into no more than 2 stacks, which are spaced no more than 30 feet apart. Walls that are overly reflective should also be covered with acoustic foam, carpet, or some other sound absorbing material. How do you feel about the Cerwin T-250 to go with T-36s as a mid-high cabinet? Is there a better choice for (underground) dance music? The problem with the T-250 is that it has a cutoff of 90Hz, and because it has only a 10" driver, does not have much ability to move large volumes of air, so you simply can't get percussive impact from it. The V-253 is definitely a better choice. That has a cutoff of 35 Hz, and would definitely give a fuller, richer sound than the T-250. The other thing is that the V-253 is a full-range cabinet, whereas the T-250 is not. An advantage of full-range cabinets (aside from the fact that you get a lot more bass and percussive impact), is that for smaller gigs (a house party for example) you can bring just the full-range cabinets, and that's all you need. The T-250 is only a mid-high cabinet and thus it is completely useless by itself. I've been reading and learning a lot about the technical side of building a system that is loud, crisp and hard to blow up. We have very limited resources, so we might build the speakers ourselves. We will probably use the old Fane book for speaker designs. Keep in mind that it's a lot more difficult than it looks if you want them to sound really good and be very solid electrically... But, it's a good learning experience, so if you have a lot of time to spare, it might be worth it. Many speakers on the market have literally decades of engineering behind them though, so you will have to do a lot of research and testing and fine tuning if you want yours to sound as good. Also, it does end up being pretty expensive building your own anyway, once you add up all the dozens of parts costs (which you pay retail for but manufacturers buy in bulk and pay wholesale for). What you spend will be probably 80% or more of the cost of just buying some good speakers outright. For starters we are planning on building a 3-way system, with 2 18" W-bins, 2 double 15" courtbins, 2 double 12" mid-low speakers, and 2 speakers with a horn and a bullet tweeter in them, using a passive crossover to split between the horn and the bullet. So I need a 3-way crossover, right? You say that you never use crossover modules in the signal chain for full-range cabinets. I understand the reasons completely, yet in the manual for EV Eliminator cabinets, they say that we have to filter any signal below 40Hz because the Eliminators cannot handle subbass frequencies. Have you worked with Eliminators and do you really run straight signal into them? Definitely. The driver may not be able to handle as much power at 30Hz then at 50Hz, but that's fine – just run it at a little less power. It's much better that it put out as much low frequency bass as it can, than it put out a bunch of midbass. Look at it this way: Those 15"'s should be putting out the exact same waveform that a kick drum would. So is EV wrong to suggest filtering out the subbass? No, they are just trying to prevent incompetent sound people from blowing out their speakers. But if you know what you are doing, know the limits of your speakers, and you configure your system properly, then you don't have to worry about that, and they will sound better as a result. How much RMS do you recommend supplying full-range cabinets from the amps? How do you ensure that the drivers won't blow? It is easy to tell because the speakers will sound like they are distorting. If you have a good ear for things, then after a while you just get a feel for when a speaker is at its max. Then just back it off a few percent to be sure. Also, the amps should never be run such that the clip/limit lights flicker more than occasionally. If your amps are rated for the program power of the speakers, and you set them so the clip/limit lights very rarely come on, and the speakers sound good, you're all set. I am trying to build some folded horn subs like the Cerwin-Vega SL36 but I can't find any plans. Can you help? I would not recommend building your own unless you have A LOT of time on your hands. It would take you probably 50 - 100 hours of labor for each one, and cost you 80% or more of what new ones would. You might be surprised how the parts costs add up. Cerwin-Vega does high quality work, that can't be matched unless you have about $20K in shop equipment. Also, the drivers they use are very good, and expensive. If you don't use the same or very similar, they won't sound good. We have seen and heard some homebuilt L36s and they are junk compared to the real thing. We bought an old JBL rig consisting of 4 W-bins, 4 mid cabs with one 12" driver each, 2 horns with a 2" compression driver each and 2 high cabs with two bullet tweeters and a 1" compression driver each. We want to run the rig 4-way. The bullet tweeters have filters to split the frequency, but the rest doesn't have any filters. We were thinking of buying 2 Behringer crossovers, which are 4-way mono, and have adjustable cutoff frequencies. What crossover frequencies do you recommend? Don't buy an active crossover, unless you use it only as a low pass filter for the bass. The Behringer should be fine, although make sure you can return it if you don't end up liking it. For your bass signal all you need is a cheap active crossover. For the mids, buy or build some simple 6dB/octave passive crossovers. Run the 12"s up to around 2 or 2.5 KHz, and the horns above that. For exact frequencies to set your crossovers at you should look at the frequency response graphs of the different drivers and see where they start to fall off. Pick the crossover frequency such that your combined response from both drivers is maximized. On the high cabinets just use a 6 or 12 dB/oct passive crossover with a cutoff of 10KHz or so. On the mid cabinets, don't filter out the bass or highs. One 6db/oct crossover for each cabinet is all you need. 6dB/oct. passive crossovers are very inexpensive, because it's only 1 part – an inductor for low pass or a capacitor for high pass. The passive crossover approach will save you money, make things easier to connect, and you won't need as many amplifiers. Though the frequency response may not be perfect, the transient response will be outstanding. Remember, only your bass needs to be super loud. Everything else can be a simple design because you don't need the mids or highs to be too loud. Is 80Hz the best cutoff frequency for bass bins? I heard some people talking about 125 Hz. The JBL 18" driver can handle between 30 and 800 Hz. 80 Hz is good for L36 type cabinets. For W bins, a higher frequency is better. 100 or 125 Hz is probably good. So, it depends on the type of cabinet. Also, if you do not have any 15"s or 18"s in your full range cabinets, unfortunately you will need the bass bins to supply more midbass. The best way to find the exact frequency to use is just run the system and find the frequency that sounds the best overall. Note that this may also depend on the venue. For example, If you have to do a small side room that has bad acoustics, there may be some midbass resonant peaks in the room's frequency response. In this case, a 125 Hz cutoff on the bins might be too high. How does the dB/octave thing work? I understand that at a certain frequency the signal is cut, but why is 24dB/octave too much. What exactly does that mean, that the cutoff is at 24dB/octave or 6dB/octave? A capacitor or inductor by itself has a frequency cutoff rate of 6dB/octave. That means 6dB less signal will get through one octave away. It's a long story, but the important thing is that you don't need anything higher than that for dance music, because percussion is what is important in dance music, not sharp cutoffs or high power handling. I am currently in the process of putting together a small system for private venues. Based on the knowledge I have gathered so far, I have purchased four Cerwin-Vega T-36 bass bins and two Cerwin V-253's. I am now looking into purchasing some Crest Professional amps to power them. What model(s) do you suggest? The next step will be to get the rest of the pieces. I know I need a leveler and some crossovers, but that's all I know. I understand I should use an active crossover on the bass bins and minimal phase delay crossovers for the full-range speakers. But what kind? Also what kind of cables should I be using to hook all this up? [...] I have a mixer but I'm looking into buying a new one. Start out with a good professional grade mixer, cartridges (higher-end Ortofon or Shure), and turntables (Technics SL1200MK3 or high-end Vestax), and a limiter or leveler. The only other thing you will then need is a low pass filter or crossover for the bass bins. It should be set at 80 Hz frequency. Only use it for the bass bins, do not run the signal for the full-range cabinets through it. Any inexpensive stereo crossover will do, just make sure it has XLR ins and outs (stay away from anything with RCA jacks). And by the way 2 V-253s and 4 T-36s is an excellent choice of cabinets for dance music. For amps, a Crest CA12 or 8001 would be good for the 2 V-253s. A Crest 9001 would be good for the 4 T-36s. Stay away from any lower cost amps than the Crest Pro or CA series. QSC PLX-series is also very good. Lower grade amps can cut out if overheated and the audio quality may not be as good. For cables, use 10 gauge cable if possible. 12 gauge cable is OK for short runs (less than 25 feet), but avoid it if possible. It does not matter what brand as long as it's thick, fine stranded, oxygen free cable. For signal cables, make sure the plugs are gold plated, and hold tightly, and that the cables look like they can take some abuse. And always have some spare cables on hand in case one breaks. I have two questions: What do you think of active speakers in general and the Mackie SRM-450 in particular? And do you have any advise for anyone wanting to learn about sound engineering and sound systems? Regarding active speakers, their overall quality and cost-effectiveness are not necessarily better than what is available with passive speakers, however in recent years great progress has been made in this area. The Yorkville Unity-series self-powered cabinets for example are very cost effective and easy to set up (particularly for smaller systems) and have DSP processing built-in which provides great levelling without overcompression, distortion, or risk of driver damage. Active speakers are also easier to transport and set up, making them ideal for portable and rental applications. And over time better active products will become more widely available and even more cost effective and better integrated, making them a better alternative in almost all applications. The Mackie SRM-450 is a good speaker for rental applications since it is so easy to transport and set up. It sounds good and has a good output level, but in terms of sound quality it is really only good as a monitor and should not be used as a main PA speaker unless just for something like a house party. It is also an ideal choice for a monitor if you are buying only one, because the passive alternatives are more cost effective only if you are getting two or more speakers (since most pro amplifiers are stereo). About learning the science of sound, the best place to start is with the web. There are 100's of websites relating to pro sound, and they have all the info you need. There are also message boards such as ProSoundWeb Forums which are an excellent resource. Beyond that I'd suggest studying engineering. This document explains the principles behind high-quality dance music sound systems. We welcome any questions, comments, and feedback. Designing a really good sound system is a complex, scientific process. If you require exceptional sound quality and are in need of an experienced sound engineer feel free to contact us. We offer a full range of services at reasonable rates, from system design and installation to engineering services, including custom hardware and software development. We are also resellers for most brands of equipment and can meet or beat advertised prices on most pro-audio equipment brands. Call or email for more information. This document © Sunsonic / David Gleason (United Records, Sunsonic). Permission is hereby granted to freely reproduce and distribute this document in whole or in part, provided the URL to this page (www.unrec.com/sunsonic/sound2.htm), copyright notice, and the above contact information are preserved.